DNMC is a group of dairy industry professionals working as a team to offer services, consulting, leadership and coaching to dairy producers and dairy heifer raisers. The group strives to offer differentiation in the nutrition industry. 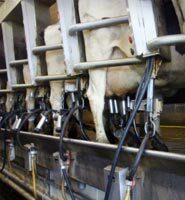 Working from more than 25 years of experience, the approach to consulting at DNMC is driven by a deep understanding of dairy production and economics. DNMC partners with and offers leadership to their clients in a variety of ways in addition to the task of traditional ration formulation. From fine tuning diets, observing cattle, collecting data and working with dairy employees to financial analysis and strategic planning, the scope of work is broad. Data from DNMC’s weekly Green Sheets and monthly reports serve as a guide for coaching efforts. The Green Sheet is a weekly report card showing the success and opportunities at the dairy. Included in DNMC’s data analysis is a unique look at items proven to drive profitability. It is a goal that the consulting efforts of the group result in maximizing and tracking true bottom-line profitability. While understanding the keys to dairy management is important, DNMC must excel in diet formulation. Through high-end technical support and a wide range of academic resources, the formulation approach stays current with the newest research results. Using an industry leading, dynamic nutrition model, DNMC is able to formulate diets while managing cost to support maximum profitability. All of these efforts are summarized in a proprietary software platform called the Feed and Milk Model (FMM). The FMM is a real-time software application that summarizes multiple rations, animal data, feed/milk values and milk production/components into predicted financial results. No matter if it is working with diet formulation, employee training, data/performance collection and analysis or tracking bottom line profitability, DNMC is deeply involved in the management of its client’s operations. DNMC strives to offer leadership to the dairy and feed industry. The staff is active in authoring both popular press and scientific publications. As well, DNMC nutritionists are sought after for conference speaking opportunities in the US and internationally. The group’s experience, scope and industry standing offer value to industry and academic colleagues in the areas of product development, marketing plans and field research. Teamwork with other professionals including veterinarians, risk managers, agronomists, etc.